By the time she released her version of the Dorsey Brothers track “What A Diff'rence A Day Makes” in 1959, a record that went to No. 8 on the pop charts, Washington was a regarded as a reputable mainstream artist. Washington had not abandoned her first love of jazz and frequently headlined at high-profile jazz festivals; her performance on “All Of Me” in the 1959 movie, Jazz On A Summer’s Day (1959) filmed at the Newport Festival, showed off her credentials perfectly. She performed at renowned jazz venues like Birdland and late in her career, also played with jazz greats Count Basie and Duke Ellington. Playing in a TV commercial near you right now is probably a Dinah Washington song. It was the use of "Mad About The Boy" in one such ad that prompted this collection. Still, let's not get too sniffy about that because if it means that more people get to hear her than that's all the better. For since her heyday of the late 1950s/early 60s Dinah has been neglected for far too long. Her's is a voice of Viagra mixed with gravel, which spans jazz, R&B and pop. This collection from Phonogram has 17 sparkling numbers from the swing of "All Of Me" to the sensuousness of "Let's Do It" and the sheer class of the title track. In each her phrasing is excellent with every consonant and vowel perfectly delivered. 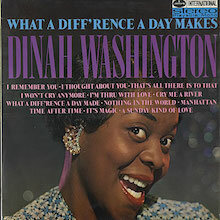 Dying tragically early at 39 Dinah Washington may not be as well know as Ella Fitzgerald or Billie Holiday but at her best and with the right tune Dinah could mix with the best. 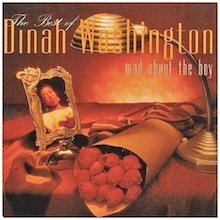 Get mad about Dinah. Gifted with a strong, beautiful voice and very precise phrasing, Dinah Washington translated Bessie Smith's irrepressible spirit and flair even better than Billie Holiday, Smith's most famous devotee. For her tribute album, Washington avoided Smith's best-known songs ("'Tain't Nobody's Bizness If I Do," "Nobody Knows You When You're Down and Out," "Baby Won't You Please Come Home"). Instead, she wisely concentrated on the more defiant standards from "The Empress of the Blues," including "Send Me to the 'Lectric Chair," "Jailhouse Blues," and "You've Been a Good Ole Wagon." Washington sounds simply glorious, focused on alternating Smith's phrasing to emphasize her own gospel roots. The accompaniment, by Eddie Chamblee and His Orchestra, emphasizes the vaudeville and Dixieland sound of early-century blues, heavy on the slide trombone, growling trumpet, and skeletal, rickety percussion. 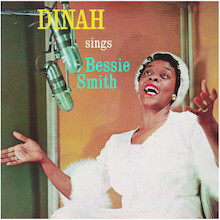 Reissued several times (occasionally under the title The Bessie Smith Songbook), Dinah Washington Sings Bessie Smith charts a perfect balance between tribute and genuine artistic statement. A Verve master edition reissue added alternate takes of "Trombone Butter" and "Careless Love," plus three songs taken from a Newport performance later in 1958. One of the more notorious albums in the history of vocal music, What a Diff'rence a Day Makes! 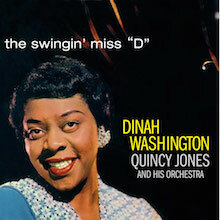 is the lush session that bumped up Dinah Washington from the "Queen of the Blues" to a middle-of-the-road vocal wondress -- and subsequently disenfranchised quite a few jazz purists. Washington had been praised in the same breath as Holiday and Fitzgerald for more than a decade, but Mercury nevertheless decided to back her with mainstream arrangements (by Belford Hendricks), heavy strings, and wordless vocal choruses similar to the radio hits of the day. Apparently, the mainstream backings didn't faze Washington at all; she proves herself with a voice as individual and evocative as ever. To be honest, the arrangements are quite solid for what they're worth; though it's a bit jarring to hear Washington's voice wrapped in sweet strings, the effect works well more frequently than not. Most of the songs here are familiar standards ("I Remember You," "I Thought About You," "Cry Me a River," "Manhattan," "Time After Time"), but they've been transformed by Washington as though they'd never been sung before. The Top Ten title track is by no means the best song on the album, but its title proved prophetic for Washington's career. Though her vocal style hadn't changed at all, one day she was a respected blues singer; the next, according to most of the jazz cognoscenti, she had become a lowbrow pop singer. Thankfully, the evidence against Washington's "transformation" is provided right here. 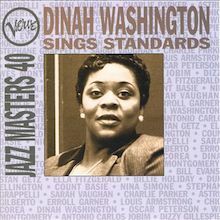 Creating yet another series to justify reissuing material from its vaults, this Verve Jazz Masters entry raids albums Dinah Washington recorded for the Mercury label from 1952 through 1958. 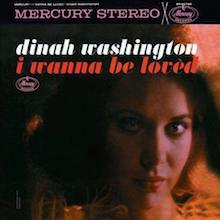 This is the second Dinah Washington compilation in this series. Although advertised as an album of standards, Washington avoids making these tunes come across as the romantic warhorses most of them are. Rather, her gospel-inspired voice conveys the song's message with a blues, funky tinge that always distinguished her from the rest of the crowd since she began her career at the age of 15. On these tracks, Washington is joined by the crème de la crème of jazz musicians who were part of the Mercury stable during these years. While some of the arrangements were not all that creative, Washington's inimitable style and the playing of her fellow musicians make up for any shortcomings. "I'll Remember April" is an 11-plus minute jam session spotlighting solos by Clifford Brown, Harold Land, Herb Geller, and Junior Mance (or Richie Powell). Washington swings hard on "They Didn't Believe Me" in front of a big band led by Quincy Jones and then goes sentimental on "You Go to My Head" before seguing into a second chorus behind a Latin beat. On the latter track Washington and the unknown group backing her is energized by the urging of a live audience. There's more Latin on "I've Got You Under My Skin" built around the trumpet trio of Clifford Brown, Clark Terry, and Maynard Ferguson. (The liner notes listing of personnel for this track are incorrect). While the album has several excellent instrumental solos, none is better than Rick Henderson's extended alto sax work on "Blue Skies." There's a relaxed traditional jazz atmosphere underlying "All of Me" with Washington chatting away in the background during solos by vibist Terry Gibbs and trombonist Urbie Green. Whatever style or beat, each tune is delivered by Washington's instantly recognizable penetrating but tender voice, buttressed by her consistently precise enunciation. 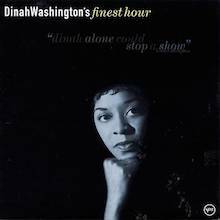 This more than an hour long album is a worthy tribute to the one of a kind vocal skills of Dinah Washington. 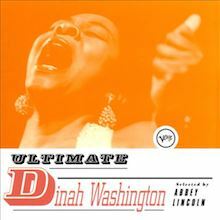 Abbey Lincoln compiled The Ultimate Dinah Washington, a 16-track selection of Washington's best-known songs that offers an excellent introduction to her Verve recordings. Although purists and collectors will have little use for this set, it suits the purposes of neophytes and curious listeners quite well. Among the highlights are "What a Diff'rence a Day Made," "Backwater Blues," "Cry Me a River," "I Wanna Be Loved," "Cold, Cold Heart," "Harbor Lights," "You Don't Know What Love Is," "I Won't Cry Anymore," "Unforgettable," and "The Bitter Earth." 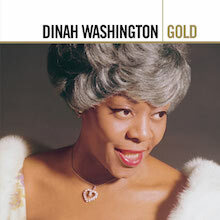 Dinah Washington's digital discography is riddled with compilations that brandish the word "Gold," as in "Golden Classics," "Golden Hits," "Golden Songs," "Golden Greats," "Golden Stars," and "Goldies." All that glitter, however, does not necessarily describe or guarantee well-produced collections. Happily, Verve's 2007 double-disc Washington anthology deserves its title, which simply consists of the word "Gold." Opening with her debut session (for Harry Lim's Keynote label on December 19, 1943) and following her progress across most of her 20-year recording career, this excellent chronological survey documents her triumphs as a rhythm & blues, jazz, and pop vocalist. The real jazz selections, in particular the nearly ten-minute take on "Lover Come Back to Me," demonstrate this gorgeous and powerful woman's "Don't Tread on Me" approach to music, love and life. Her formidable, somewhat volcanic interpretations of Bessie Smith's "Back Water Blues" and the torch song "All of Me" come from the 1958 Newport Jazz Festival. This historic episode can and should be enjoyed as a scene in the motion picture Jazz on a Summer's Day. Backed by the Terry Gibbs Sextet, Washington grabs a pair of percussion mallets and smilingly intrudes upon Gibbs' vibraphone solo during "All of Me," bumping him aside with a sway of her hips and demonstrating more than passing familiarity with the instrument (not altogether surprising since she originally appeared on the scene as vibe king Lionel Hampton's precocious upstart vocalist). The startling segue from the explosive climax of "All of Me" into the string-laden, chorally sweetened masterwork "What a Difference a Day Made" provides a healthy contrast that might tweak those who disparage such sugary production techniques. The lesson, of course, is that Washington sounded great under any circumstances. Furthermore, she consciously made the decision to record with strings as did Billie Holiday, Charlie Parker, Ben Webster, and Coleman Hawkins. Each of these artists used the chamber or orchestral format to achieve a number of personal goals that included dignity, delicacy, and of course, economic stability. Complaining about Washington's string section is as pointless as poking fun at her wigs, gowns or tiaras. One doesn't focus on Earl Hines' toupee -- one listens to the music he plays. Put aside all preconceptions and surrender your heart. Verve's Gold portrait of Washington is a superb tribute to a sublime artist beside whom a lot of other singers sound immature, insecure, insincere, or anaemic. Verve continues their Finest Hour series with Dinah Washington's Finest Hour, an 18-song collection highlighting the entire range of her repertoire, from blues to jazz to pop. "Evil Gal Blues," "What a Diff'rence a Day Made," "West Side Baby," "Trouble in Mind," and "Blue Gardenia" make this set an entertaining, if not comprehensive, overview of Washington's wonderful vocal gifts. 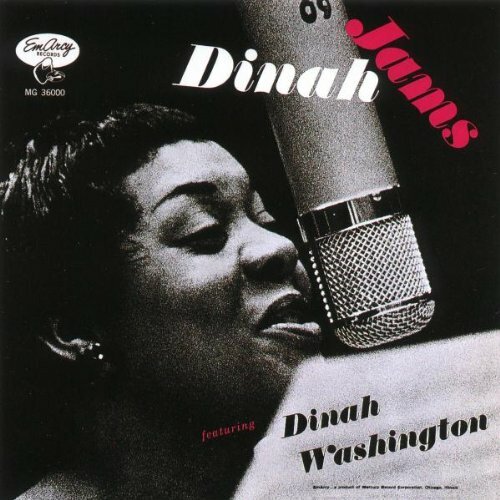 Recorded at the start of Dinah Washington's climb to fame, 1954's Dinah Jams was taped live in front of a studio audience in Los Angeles. While Washington is in top form throughout, effortlessly working her powerful, blues-based voice on both ballads and swingers, the cast of star soloists almost steals the show. In addition to drummer Max Roach, trumpeter Clifford Brown, and other members of Brown and Roach's band at the time -- tenor saxophonist Harold Land, pianist Richie Powell, and bassist George Morrow -- trumpeters Maynard Ferguson and Clark Terry, alto saxophonist Herb Geller, and pianist Junior Mance also contribute to the session. Along with extended jams like "Lover Come Back to Me," "You Go to My Head," and "I'll Remember April" -- all including a round of solos -- there are shorter ballad numbers such as "There Is No Greater Love" and "No More," the last of which features excellent muted, obbligato work by Brown. Other solo highlights include Land's fine tenor solo on "Darn That Dream" and Geller's alto statement on the disc's standout Washington vocal, "Crazy." And even though she's in the midst of these stellar soloists, Washington expertly works her supple voice throughout to remain the star attraction, even matching the insane, high-note solo blasts trumpeter Ferguson expectedly delivers. A fine disc. Newcomers, though, should start with more accessible and more vocal-centered Washington titles like The Swingin' Miss D or The Fats Waller Songbook, both of which feature top arrangements by Quincy Jones. A torch song date recorded between Dinah Washington's commercial breakthrough in 1959 and her death in 1963, I Wanna Be Loved flaunts a large cast of talented collaborators -- plus, to be sure, Washington's regal readings of 12 great songs -- but, unfortunately, the musical side is overwhelmed by the heavy strings in attendance. Working with Quincy Jones, Washington found her studio cast to include Joe Newman and Clark Terry on trumpet, Jimmy Cleveland and Kai Winding on trombone, and Al Cohn on tenor. However, the arrangements (from Ernie Wilkins and Quincy Jones) rarely leave room for the musicians -- and, in fact, rarely feature them at all -- preferring instead to concentrate on strings and the occasional wordless vocal chorus. As usually happened in these circumstances, Washington appears unfazed by the treacle surrounding her; although she doesn't improvise, her performances of "Blue Gardenia," "Don't Explain," and the title track (originally an R&B hit for her 12 years earlier) are elegant and bewitching. The larger big band makes its presence felt on the two side-closers, both of them ("Let's Fall in Love," "Sometimes I'm Happy") more uptempo material. Although Washington's latter-day Mercury material is often derided, she always succeeded despite her surroundings, and this date is no different.